Milan Djurdjevic - piano, hammond organ, synthesizer, vocals. Founder and creative leader of the band, keyboardist, vocalist, author of music and lyrics, arranger and producer...simply - the soul of the band. Born in Valjevo, on March 31st, 1967, since young age, he plays classical music. At 11, he starts playing on Valjevo's Youth Centre and already at 13 - with Vlajko - he creates his own band and performs his own compositions. With a band called "Nova Zemlja" (New Land), he wins a prestigious Guitar Contest in Zajecar in 1983 based on the decision of an audience and a professional panel of judges. He records an album "Letaci" which is released in 1985 by PGP RTB. "Nova Zemlja" becomes a cultish sympho-rock band and the first band from Valjevo to release an album. 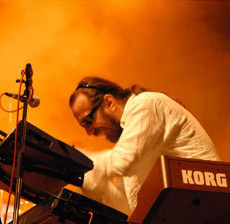 In 1984. he moves to Belgrade with Vlajko and becomes one of the most sought-after keyboardists. In 1986, he is invited by one of the greatest bands from the former Yugoslavia "Smak" and spends 2 years with them. He records an album "Smak 86" and goes on tour with one of the best groups in the history of YU Rock Music. This lineup of "Smak" was to be remembered: R.M. Tocak - guitar, Zoran Milanovic - bass, Kepa Stojanovic - drums, Boris Arandjelovic -vocals and Milan Djurdjevic - keyboards. Towards the end of 1987, he goes to Ljubljana to serve in the Army (YNA - Yu National Army). In late 1988, upon returning from his Army Service, with his brother Vlajko, he reunites with "Nova Zemlja." Due to some problems with releasing new material and a lack of understanding from publishing houses, the band moves in another direction - covers. In a very short time, the band becomes the most famous and most popular band in the entire Yugoslavia. Their visits to Istria (which back then was the scene of all mainstream cultural happenings in the region) will be remembered as the pinacle of all. Foreign managers immediately reacted and "Nova Zemlja" spends 1989 almost entirely abroad while playing numerous clubs and discos. Milan was receiveing unbelievable offers - from being a promoter of different synthesizers in world's big store chains to several serious offers from producers to join various bands in the West. He rejects all offers because of his original ideas which were, even then, very complex and required a lot of patience when it came to visions of music, career, and realistic presentation in the music industry. As a leader of the band that had some serious quality, Milan endured a big boycott of certain cliques and music critics, especially from the realm of alternative music. As a man who firmly believed in his ideas, he chooses a road which, at this moment, seemed like the only solution: concerts, performances in clubs all over the country and Europe. Within a short period of time, "Nova Zemlja" becomes the most sought-after band in the country and Milan - keyboardist with the greatest number of fans and the greatest respect from young musicians. As a keyboardist, he played in many sessions with all well-known musicians from the former Yugoslavia. In 1991, along with Vlajko, he joins a group called 'Frenky" and records an album "Plakao bih al nemam s kime". Already at "Mesam" (Annual Music Award Show), that same year, he gets an award for Arrangement of song "Ljubim a znam" (also voted 2nd place by the audience) and in 1992, he also wins at "Mesam" with a cultish sympho-rock composition "Saga", which set some new standards in Serbian pop art culture. At the beginning of 1993, with Vlajko and a drummer Cedo Macur (soon they are joined by a guitarist Bane Jelic and later Billy King), he makes his very own first project "Neverne Bebe" (Unfaithful Babies). Early in 1994, he releases an album " Neverne Bebe I", which to this day is one of the most popular and most covered albums among young musicians in the country. He plays Fusion, Ethno & Classic Music, prepares an ambiental solo album in which he had put much time and energy and whose realization was nearing an end. He writes film music and at the same time participates in a creation of spiritual music as an eminent author, arranger and producer. He collaborated with various artists and as a studio musician, he played on many domestic pop and rock music albums. With his energy and perfectionism, he is also well-known outside of music circles. With his band, he set a standard of up to 100 to 140 highly professional concerts a year. Plus his work in the studio, plus rehearsals. It is said that he DOES NOT DRINK and DOES NOT SMOKE and that he has a similar rule for his band - no alcohol before and during the concert. While very controversial in life, many stories circled around him, but with his great quality and attitude towards life and music, he proved that he was absolutely born to write, compose and perform music and is grateful for a God-given talent and love of esthetic values of art. Musical role models: Pat Metheny, Pink Floyd, Sergei Rachmaninov.